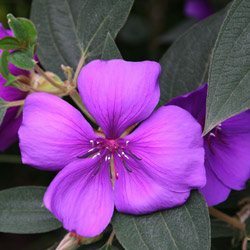 It is amazing how Australia has fallen in love with the many Tibouchina varieties now available. Originally from South America they will grow well in cooler areas and thrive in warmer climates. Here in our cool winters, they thrive in a sunny frost free position. Varieties such as ‘Alstonville’ and the smaller growing Tibouchina ‘Jules’, are popular varieties of this free flowering shrub or small tree. Characterised by large purple flowers, they come in other colours than purple including pink and white. They also come in dwarf forms. So variety is available to fit most landscaping needs. Tibouchina ‘Alstonville’ is very popular in Australia, wonderful velvety textures foliage and glorious purple flowers. In Australia these plants were commonly called Lasiandra, in fact the small town of Wauchope has a Lasiandra festival around March each year. The ‘Purple Glory Shrub’ is a much loved plant in QLD, however in the right conditions it is a plant that can be grown as far south as Melbourne where we have seen them growing successfully in the Dandenong Ranges outside of Melbourne as shrubs or small trees. In a good protected position they require very little care, a slightly acidic soil will assist with growth. All varieties prefer a well drained, slightly acidic soil, a ph of 5-6, however they are reasonably versatile and will grow in most warm to temperate regions. Tibouchina can be pruned after flowering to maintain shape. These are pest and disease resistant plant. These are a plant that naturally grow well in an open understory position. They flower in late summer to autumn. Plant in a frost free position with protection from very hot afternoon sun. Branches are prone to wind damage especially when laden with flower buds so protect from strong winds. A humus rich moist soil and remember to mulch in summer. Tip prune to keep in shape in spring to late summer. Hard prune in early spring if required. Slow release fertilizer in spring and some liquid seaweed fertilizer in late summer seems adequate, although these do not seem to be a ‘hungry’ plant. Mulch around the plant with sugar cane mulch to maintain moisture. The best time to propagate Tibouchina or Lasiandra plants by taking cuttings is in spring as the weather warms a little. If you take a cutting at around 15 cms, or 6 inches just below a leaf node, with 3 sets of leaves, plus the tip above the cutting. Remove the lower two sets of leaves with a sharp knife. Leaving the top set of leaves plus the tip. Dip the stem into some honey, or a hormone rooting powder. Plant the cutting in a 50% perlite 50% fine potting mix. Water regularly with a liquid seaweed fertiliser and mist spray frequently over the first few weeks. For best results place the cutting in its pot under a clear cover to retain humidity. Leave the cutting in a warm shady position until you see good signs of new growth. 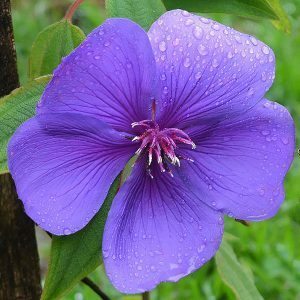 If your Tibouchina is not flowering it could be for a number of reasons. Pruning at the wrong time of the year, they are a plant that needs to be pruned just after flowering. To much fertiliser, if you over fertilise with nitrogen rich fertiliser you will get leaf growth rather than flowers. The flowers are seen as being purple, typical of the ever popular ‘Alstonville’, however pink flowering varieties such as ‘Kathleen’ have been available for some years. Some varieties have flowers that change colour and ‘Noeline’ was one of the first, white flowers that turn topple over a few weeks. ‘Alstonville’ To around 3 metres in height with a similar spread. Easily pruned to 1 metre. A proven performer and easy care. ‘Jules’ Will reach around 1 – 1.5 metres and is very long flowering. This is a variety that seems to require better drainage than most. T. ‘Purple Pixie’s’ is a low growing variety to 2m. T. Jazzie is even smaller to around 1.5m similar to Jules in height. T. urvilleana grows to 4m. The dwarf forms are excellent for growing in containers, however will still need protection from frosts. The first dwarf variety we encountered was ‘Jules’ and reaching around 1 metre in height it is a great selection for growing in a container. ‘Groovy Baby’ A good choice for container growing, will reach around 50 cm in a rounded bushy shrub. Long flowering. ‘Peace Baby’ If you want white flowers in small growing shrub, this is the one. Peace Baby has pink stamens contrast well against the white petals, this is a dwarf variety developed in Australia. Cool Baby develops a mixture of white and pink flowers, another small growing cultivar suited to containers.